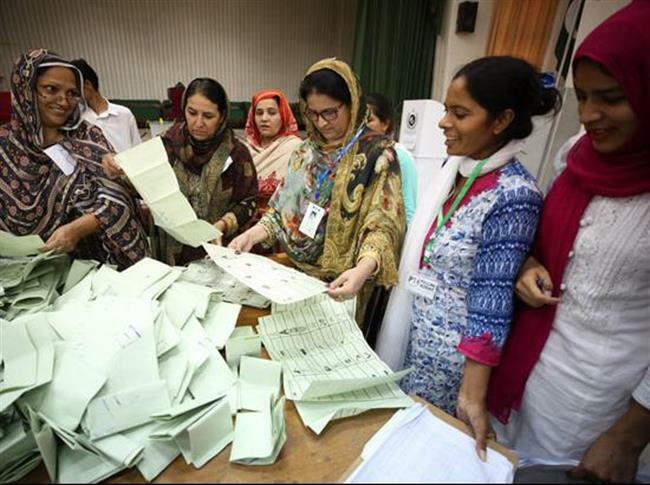 ISLAMABAD, July 25, 2018 - Election officials count votes in Islamabad, capital of Pakistan, on July 25, 2018. The Pakistan-Tehreek-e-Insaf (PTI) led by celebrity cricketer Imran Khan was ahead of its rivals as the trends of the counting of votes showed. The PTI was leading in 99 seats, its nearest rival PML-N of former PM Nawaz Sharif in 54, Pakistan Peoples Party (PPP) in 31 and others in 59 seats. To stake claim to form government, any party will have to have 137 seats in its kitty.